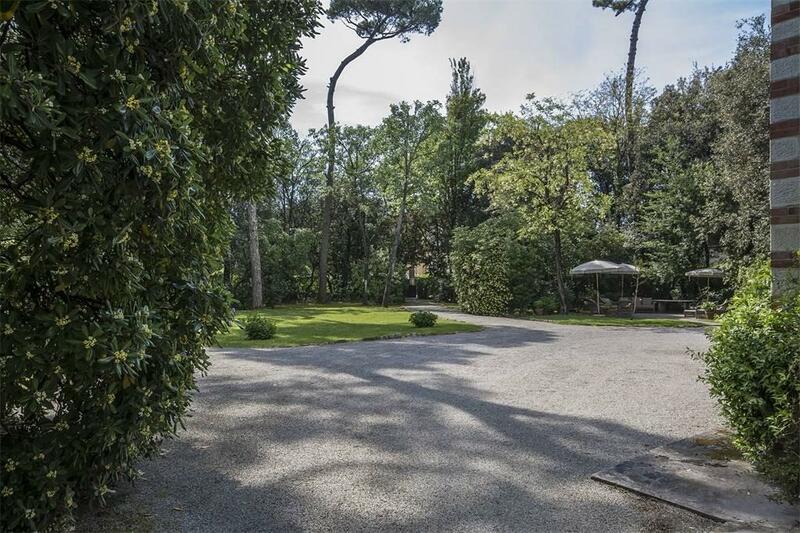 We present, in its essential features, a prestigious villa of about 600 sqm., located in a quiet and exclusive residential area of Forte dei Marmi, named Roma Imperiale. It is equipped with a garden of over 5,000 sqm. in which we find a tree tall trees and flowering shrubs that give off scents of the mediterranean. The property is one of the most ancient of the popular resort of Versilia, and is located just 100 metres from the beach, this elegant manor house , cared for daily,created in 1924, is considered ideal as a holiday home or as a residence to spend long periods in autumn or spring. 1) on The ground floor, just inside the house, we have a large entrance and staircase, with access to the living room that leads to the spacious and bright living area with fireplace and from here, to the dining room. We then find an office and a large kitchen, room for staff with private bathroom and independent entrance at the back of the garden. A pantry and a bathroom complete this floor. 2) The first floor has three large double bedrooms with wooden floors of the era, and three bathrooms (two en suite); a large and nice library / study with fireplace completes this first floor. 3) The second floor consists of two large double bedrooms, three single bed rooms and three bathrooms. The further information will be provided to the persons concerned only and exclusively after having been qualified and have signed a letter of interest. The notice to visit the villa should be 36/48 hours.